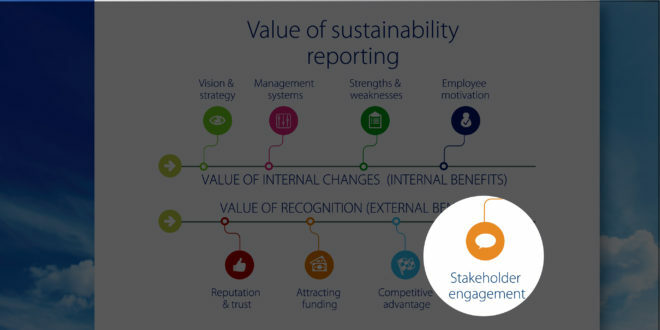 Companies see the sustainability reporting process as an important tool to show transparency and disclose their sustainability performance to stakeholders. They see the reporting process as an opportunity for reflection of corporate social responsibilities and for listening to their stakeholders. They see “transparency” and “dialogue” as connected. The opportunity for dialogue could come at the beginning of the reporting process, when a company is self-assessing its performance and selecting the “material” issues to monitor and report on, but can also continue throughout the entire process—e.g. before and after defining the final report’s format. In general, organizations think about dialogue after a report is finished, which is not where the whole value is. By entering into dialogue with different groups, an organization can gain insight into internal and external points of view. The report is, as a matter of fact, a good excuse for bringing people to the table. Through the relationships the reporting process can create between an organization and different stakeholder groups, the organization can get feedback on different areas and review processes and business opportunities. Stakeholders become participants in co-creating value for an organization.